"Pizza is in our soul. From working at a pizzerias a 16-year-old, to starting his own pizzeria as a 19-year-old, Justin Klavon had a love for serving people. 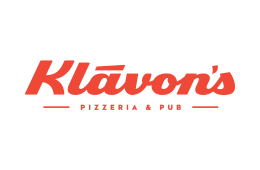 After growing to 3 take-out & delivery pizzerias, Justin sold them and in 2007 opened the first Klavon's. Today, we celebrate 10 years and two locations in Jackson, MI. The Chicago-style stuffed pizza, Pizza Napoletana and Detroit-style pizza are just a few of the items we are so well-known for. Each pizza is perfectly crafted to embrace its classic originality. From our genuine service to our food quality, Klavon's is authentic in everything we do." For balance inquiries call the phone number to a Klavon's Pizzeria & Pub's location below.